Will Modi find a reliable shoulder down south. 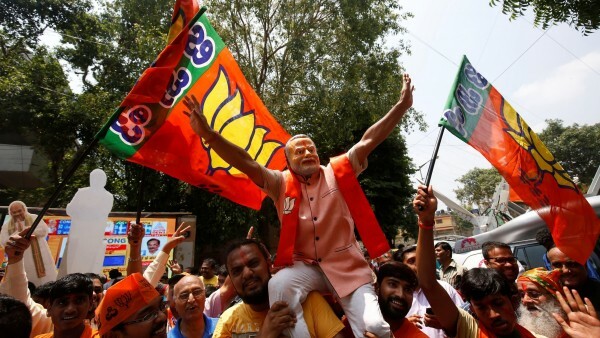 The Bharatiya Janata Party (BJP) is seriously looking for allies in the southern states for the coming Lok Sabha elections to improve its tally from 21 to make up for possible losses in the Hindi heartland states where it had made almost a clean sweep in the last polls. The BJP has been making determined efforts to make inroads into the South, particularly after its victory in the last Lok Sabha polls, and is keen to improve its number of seats in the region where it has been perceived to be weak except in Karnataka. Party leaders feel the party will need allies to even retain the 21 Lok Sabha seats it had won in the 2014 general elections. Of these 21 seats, the BJP won 17 in Karnataka alone, the state which still remains its gateway to the South. The five southern states — Karnataka, Tamil Nadu, Andhra Pradesh, Telangana and Kerala besides Puducherry — account for 130 Lok Sabha seats. A top BJP functionary, who spoke on the condition of anonymity, conceded that the southern states remain a challenge for the party. “Without alliance in southern states, we won’t be able to even retain the existing seats. It remains a significant challenge for us,” the functionary said. “Besides strengthening the party and (Narendra) Modiji’s charisma, we need to forge alliances with regional parties,” he said. While Karnataka is the only southern state where the BJP has had a chief minister, challenges for the party have grown over the past year after it emerged as the single largest party in the last state assembly elections. The Congress and the Janata Dal-Secular are running a coalition government in the state and will contest the Lok Sabha elections together unlike the assembly polls, which they fought separately. The BJP has also lost a key state leader in Ananth Kumar, a six-time party MP, who passed away in November 2018. However, the BJP leadership is hopeful of meeting the challenge posed by the Congress-JD-S combine. Together they accounted for 56 per cent vote share in the last assembly polls (Congress 38 per cent and JD-S 18.4 per cent). But BJP leaders feel the Lok Sabha elections will be different as it will be a choice between Prime Minister Narendra Modi and “a disjointed opposition” that does not have a clear leader. There is also some evident unease in the ruling state alliance. “The alliance of the Congress and the JD-S in Karnataka would not make much difference to us. There are some constituencies where both parties are head to head and at worst we get one or two seats less than the last elections,” a senior party leader associated with party affairs in Karnataka said. The BJP is also keenly looking for alliance in Tamil Nadu and Andhra Pradesh. In Tamil Nadu, the BJP and the ruling AIADMK are inching to a formal alliance and the saffron party is also keen that actor-turned-politician Rajnikanth joins the alliance. The party had won one Lok Sabha seat in the state in 2014. “Efforts are on, but how it will take shape we can’t say right now. Modiji has good relations with AIADMK leaders,” another party leader said. He said Rajnikanth can fill the political space created by deaths of AIADMK leader Jayalalithaa and DMK leader M. Karunanidhi. “Neither (M. K.) Stalin nor any AIADMK leader has the kind of appeal which Jayalalithaa or Karunanidhi had,” he said. In 2014, the AIADMK swept the general elections in Tamil Nadu and the BJP could win only one seat. In Andhra Pradesh, where the BJP had won two seats in 2014, the party appears keen on alliance either with the YSRC Party of Y.S. Jagan Mohan Reddy or with the JanaSena of Pawan Kalyan after the TDP quit the NDA last year over the issue of special category status to the state. However, none of the two regional parties appears keen to be seen close to the BJP because the ruling party at the Centre is being portrayed in the state as “anti-Andhra” over the demand of special category state. “But possibilities can never be ruled out in politics,” BJP General Secretary Murlidhar Rao told IANS. In Telangana, where the BJP won one seat in 2014, the party has made up its mind to go alone as its leaders are of the view that possibility of alliance with the TRS has almost finished after the Assembly polls last year, which were swept by the ruling party. In Kerala, the BJP feels it would be in serious contention in at least five seats. Party leaders claim their stand of trying to protect the tradition of the Sabarimala temple will help the party electorally. In the 2014 Lok Sabha polls, the BJP had a vote share of 10.33 per cent, which went up to 15.10 in the 2016 Assembly elections. The BJP also opened its account in the state.